Tamika Catchings drives the ball up court. Photo by Frank McGrath/Indiana Fever. Fans had stopped to take pictures of Tamika Catchings as she was interviewed post-game in Los Angeles on Tuesday. The minute the Indiana Fever’s most celebrated franchise player peeled off the earphones, fans yelled her name. 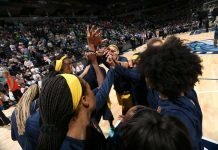 The love fest continued as Catchings walked to the locker room tunnel at Staples Center, where fans called her and reached their hands out for a shake or a high-five. She finally broke away to run inside, looking over her shoulder twice with a smile. 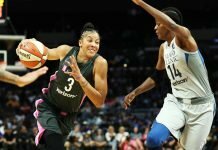 It’s a scene that’s being played out across the country this summer, as the 36-year-old multiple-record holder and ten-time All-Star announced in the spring that she would retire after the 2016 WNBA season. Fans are making sure to see Catchings as many times and as close up as they can before that time. It’s also a scenario that’s sure to continue for another year, as some who have sought her have even mistakenly believed that this it is this season that is her last. “Everybody’s trying to get me to quit this year, but I’ve got one more time!” Catchings joked. No doubt fans are anticipating the gaping hole that will be left in Catchings’ absence. 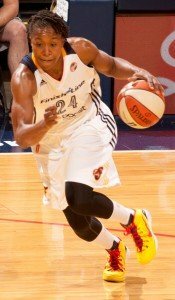 She is the last of a dying breed: an athlete who will retire from the same franchise that drafted her in 2001; one who plays with the same energy and intensity as she ever has, diving for loose balls when necessary; a complete player who fills up the stat sheet; one whose consistency, work ethic and leadership have made her the face of the Fever franchise, and a great ambassador for the league. Catchings is also a leader on the stats sheet. This season she became both the league’s second-highest leading scorer and the second-highest leading rebounder. She’s the all-time steals and free throws leader, and ranks seventh all-time in assists. In 2011, Catchings was named the league’s MVP. The following year, she lead the Fever to their first WNBA Championship. “When your leader is your hardest worker, it really sets the tone,” White said. Catchings went to high school in Texas and then played for coach Pat Summitt at Tennessee, where she went from a shy young woman to a fully-formed athlete. She used the severe hearing loss she was born with as motivation, and she still doesn’t back away from challenges. Before this week’s game against the Sparks, Catchings said she had originally been assigned to guard Los Angeles forward Nneka Ogwumike. Catchings wanted to guard Candace Parker, a fellow Tennessee alumni and a friend. “I said, ‘I want to guard Candace! '” Catchings recounted. She got her way, setting the stage for a one-on-one battle that fans always look forward to seeing. Catchings also helped ignite Indiana’s second-half run that lead them to victory. “For me it was being more aggressive down the stretch, looking up at the scoreboard and seeing if I could do more,” she said of the game. After next year, however, Catchings will be doing more in different arenas. She is still exploring what other career paths she might pursue in addition to expanding her Catch the Stars Foundation for youth, which she plans to grow from her hometown in Indianapolis. Catchings is also engaged. She is keeping her fiancee out of the public eye, but said his first name is Parnell. They plan to wed sometime in 2016. 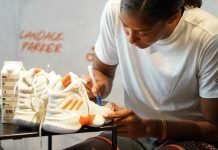 Another thread in the tapestry of Catchings’ uniqueness is that after ten years of playing overseas in the winter, she’s stayed home the last four years, while many of her peers are increasingly opting for more money in other countries, including during WNBA season. For Catchings, it’s been about looking ahead. For now, though, Catchings and the Fever are concentrating on making this year’s playoffs. After a rough season start, they saw players come back from injury and overseas committments and began to surge – particularly after the All-Star break last month. Indiana is currently second in the Eastern Conference, where the top five teams are neck and neck. White said Catchings is flowing with her impending transition to retirement. “Tamika has been amazing because she understands where she is in her career. She understands that while she’s a huge piece, she’s becoming a huge piece of the puzzle rather than ‘the’ piece,” White said. The Fever play the Storm Friday, on the last stop of a West coast road trip.